Nara is situated a short train ride away from Kyoto and makes for a very enjoyable day trip. Although it would have been nearly as easy to use the JR pass we took the Kintetsu train down to Nara … it was the more convenient and direct option. The other downside of taking the JR line is that there is further to walk to the main sites once you arrive in Nara! Our sightseeing in Nara was over another hot and humid day. By now we had learned that sightseeing should be taken at a steady (slow!!) unhurried pace. Sprinkled with some tolerance and patience. It's often through the mid-day hours and is tiring. It is worthwhile making some effort to find a quiet shady area where you can sit and take a rest. As one approaches one gets an appreciation of the size of the building … it's massive. 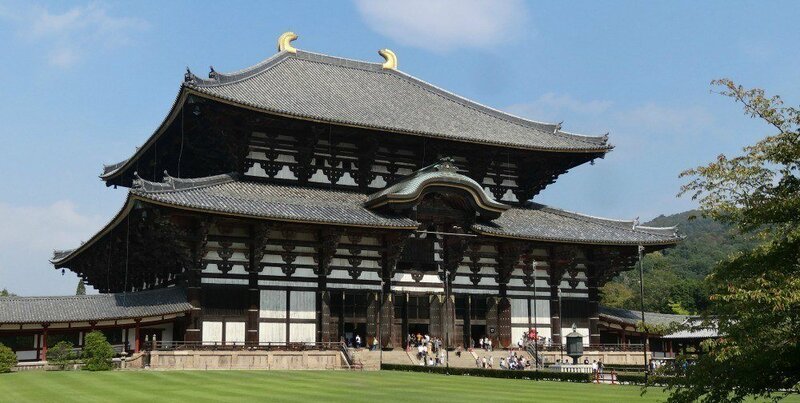 The world's largest wooden building. Towering above the people who look like ants swarming at the entrance. Inside there is an equally imposing statue of Buddha flanked by two golden statues. It is hard to appreciate how large this building is without actually seeing it. The walk up the hill and through a shady forest makes a pleasant transition from the Todaiji Temple to the Kasuga Taisha Shrine. Past an enormous bell which is a site for many selfies. Situated in a forest surrounded by so much of nature - trees, animals, deer, birds, plants and insects. Perfectly located in this forest surrounded by so many tao elements. Shrines are traditional Japanese (Taoism) and are characterized by a torii gate (two pillars with a cross piece that extends over the pillars). Temples are Buddhist and characterized by a pot of burning incense at the entrance and a cemetery at the back. After originating in India Buddhism was brought to Japan by China. Japanese embrace both and alternate between the two for their New Year’s celebrations. Traditionally Japanese get married in a shrine and buried at a temple. Sightseeing should be done at a leisurely pace. With time for appreciation and reflection. Package tours are not the ideal for getting the most out of sightseeing. Weather, days of the week, public holidays and holiday periods make the experience very different.